New Pre-Assembled 31 Spline Track Lock for Ford 9" Rear Differential with 31 Spline Axles. Select your rear differential in the drop-down box. 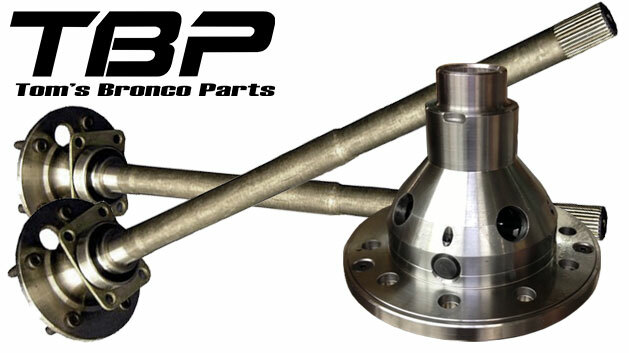 Complete/assembled Heavy Duty 31 spline Axles. Our 31 spline axle shafts are up to 60% stronger than factory 28 spline axles! This is achieved by compounding the added strength of using more splines which are rolled rather than cut with the use of stronger 1541H heat treated steel. Drum measurements are made from the inside of the drum. Axle utilizes a Set 20 axle bearing which gets lubricated from the differential fluid for extended life. This eliminates the factory outer axle seal.